‘Top 10 Cairo & the Nile‘ opens with the ten unmissable highlights including the pyramids of Giza, the mosque of Al-Azhar, the temple of Philae and the Valley of the Kings. Carrying on from there, other top tens featured in the guide are temples, Islamic architecture, museums, souvenirs, restaurants and children’s attractions. There is something for everyone, whether the interest is Egyptology, mosques, or contemporary culture. You can find out about festivals, whether religious or secular, and discover the ten most typical Egyptian dishes, including koshari and molokhiya. The next section of the book gives top tens according to area: central Cairo, old Cairo, beyond Cairo, Luxor, and Aswan and Lake Nasser. There is a fair amount of information here on monuments, museums, restaurants, places to shop, outdoor activities and cultural venues. Coptic Cairo is featured as well as Pharaonic and Islamic monuments. The Top 10 Unmissable Experiences is a fascinating list that includes a variety of suggestions for tasting Egyptian life. These range from drifting in a felucca (sailing boat) to visiting a belly-dancing club. The final section of the book is entitled Streetsmart and opens with practical information such as how to get to Egypt, how to travel around once you are there, and where to find information. There is even a page listing ten things to avoid, from getting drunk to public displays of affection. There are nine pages on accommodation, from luxury to budget hotels in Cairo, Luxor, Aswan and Abu Simbel, plus several in Alexandria and Port Said – the top ten of each are listed. The index to the guide covers six pages and seems to be pretty comprehensive. The Phrase Book, however, consists of a mere two pages and is therefore very limited. It includes sections on emergencies, eating out, hotels, shopping, numbers and days of the week as well as generally useful words. If your knowledge of Arabic is extremely limited and you are staying any length of time, you will need a more comprehensive phrase book than this. There are maps of Cairo and the Nile and Cairo North inside the fold-out front cover, while the back flap also gives plans of Cairo South as well as Alexandria, Aswan and Luxor, Karnak and Thebes. There is in addition a pull-out map and guide giving sixty ideas on how to spend a day. There are a few other maps dotted throughout the book, but some of these are very small. 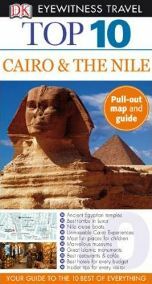 ‘Top 10 Cairo & the Nile‘ is a light-weight guide whose small format makes it perfect for carrying around. Many of the photographs are quite tiny, but they are all in colour and make for an attractive guide. The amount of information will likely be enough for tourist spending a week or two in the areas featured, but anyone intending to live in Cairo or make an extended stay in Egypt will probably need a more detailed guide book. No Comments on "Top 10 Cairo & the Nile"